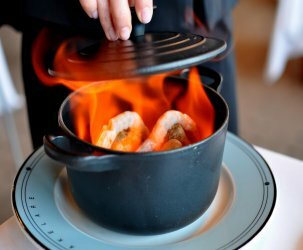 It seems that Los Angeles’ flourishing mobile food scene grows more interesting, and not to mention competitive, by the day. The little Korean taco truck that could has inspired entrepreneurial Angelenos from every corner of the city to bring their gourmet offerings to the streets. In just the past few months, dozens of trucks have popped up serving everything under the sun from Japanese rice burgers to Hawaiian-style shaved ice. And most recently, Indian dosas. In this down economy, roach coaches have become the great equalizers. The lower start-up costs associated with these ventures have made it possible for ordinary people who possess the essential combination of drive and creativity to take the wheel, literally and figuratively. 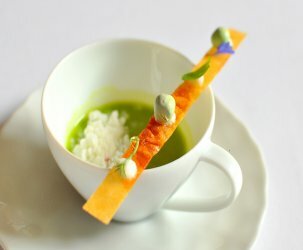 The food can oftentimes be hit or miss, but the awesome passion of these individuals is always present. I’ve wanted to sample L.A.’s brand of street food ever since Kogi hit the ground running, but alas, only the Westside was privy to such trendy action. The San Gabriel Valley always gets the short end of the hipster stick. My dreams of meals on wheels were finally realized this weekend while chilling in Venice. A collection of trucks, including Kogi, Cool Haus, Fishlips Sushi, Get Shaved Ice, and Dosa Truck, were gathered at The Brig on Abbot Kinney. Since I don’t find myself surrounded by mobile food vendors very often, I wanted to hit them all. The proud Brooklynite who owns Dosa Truck chose to sell these delicate South Indian morsels as a nod to the cuisine she grew up eating. Upon hearing that she hailed from New York, I asked if her venture was inspired by Washington Square Park’s famous Dosa Man. She said that she gets that all the time, but no, the idea for Dosa Truck was all her own. In fact, she has always wanted to open a restaurant, but couldn’t afford to do so financially. 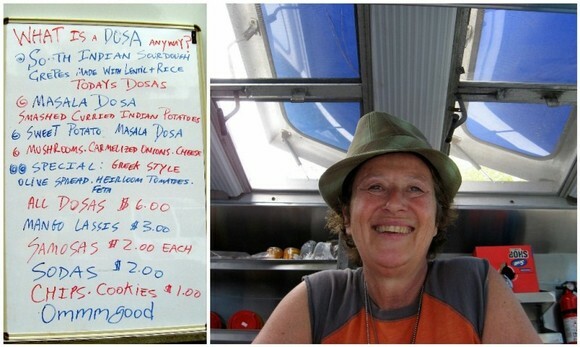 The mobile food trend allowed her to fulfill her dreams in an unconventional way. The sweet potato dosa ($6) that I sampled was made to order and arrived hot, long, and lean. The filling, which was a touch too cool, provided an interesting spin on traditional potato and onion dosas. The crepe was crispy in the right spots, but too sour for my taste. 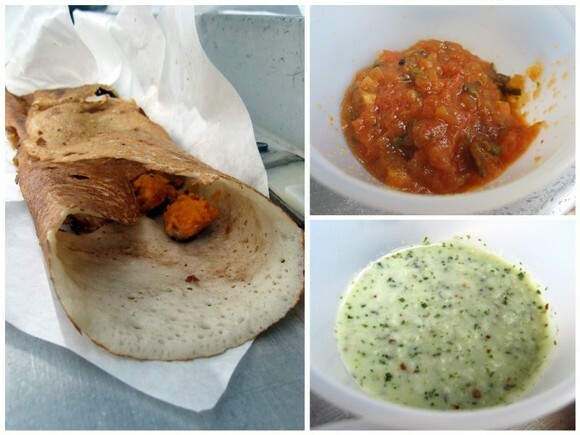 What made the dosa experience worthwhile were the bloomed spice chutneys served alongside. The mint and coconut chutney was especially appealing. 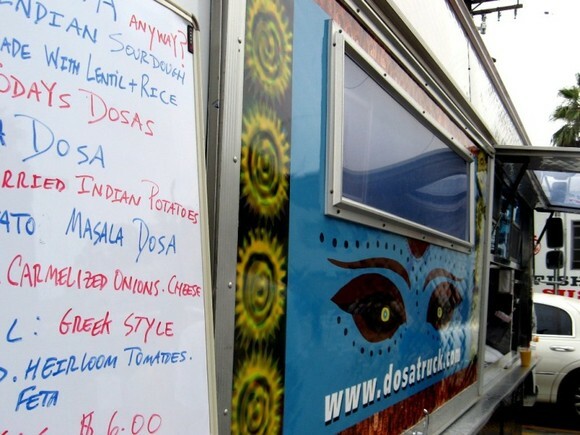 Follow Dosa Truck on Twitter @dosatruck. I’ve never had a dosa. Can you believe it? Tragic, I know. I love it! Hope that concept makes its way up north. 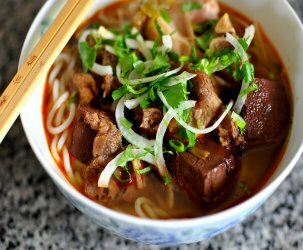 “Hot, long, and lean” – stop describing me in your blog posts! Anyone has a contact # for the owner of dosatruck – I’ve been trying to reach her for days!!! I tried the email on her website and twitter and no response! I want to hire her this week! the dosas were horrible and her artwork with its stereotypical indian cliches were kinda offensive. seriously overpriced – $6 for a small dosa, when you can get one twice at large for $5 with sambar as well at India Sweets & Spices (in Atwater Village as well as other locations). Very little filling inside, and rather bland-tasting. No chutney or sauce. Just a light snack, certainly not worth $6. There is far better mobile Indian food out there now.